Earlier this week we made an overnight visit to Canberra. The reasons were straight-forward. My son-in-law had never seen the capital of what is now his country of residence, and I wanted to visit my brother and his family. My brother and I have an untroubled relationship, but neither of us is good at organising to see the other. A visit was long overdue. As always, Canberra seemed to me a city of contradictions and compromises. As all Australian schoolchildren know (and as anyone who tours Parliament House (as we did) learns), Canberra's location results from an attempt to assuage the rivalry between Sydney and Melbourne. All state capitals in Australia are seaboard cities - looking outwards to the rest of the world from where all of us, other than indigenous Australians, arrived. Canberra is resolutely land-locked in the most Australian of landscapes. Rolling hills, paddocks, gum trees - even kangaroos - not only surround the city but are interspersed between the devolved centres of development. And yet, until recently, most people in Canberra came to Canberra from elsewhere. It's a recent creation and very much the result of internal migration. 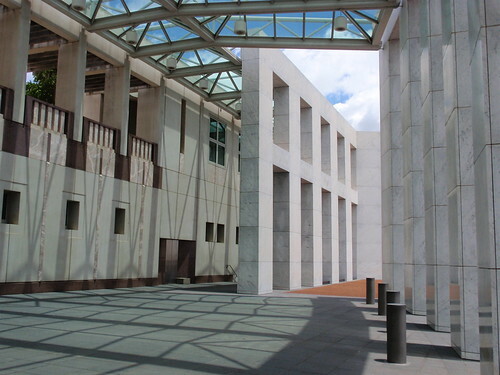 Canberra is a city of public institutions and the grand buildings that house them. But it's also an informal city that allows visitors easy access to its grandeur. It seems to regard its institutions as belonging to all of us and encourages us to participate. This was really evident in our visit to Parliament House. You need to go through security checking of your bags and person to enter, but once inside the grandeur of the building is balanced by groups of people informally chatting and wandering and exclaiming. 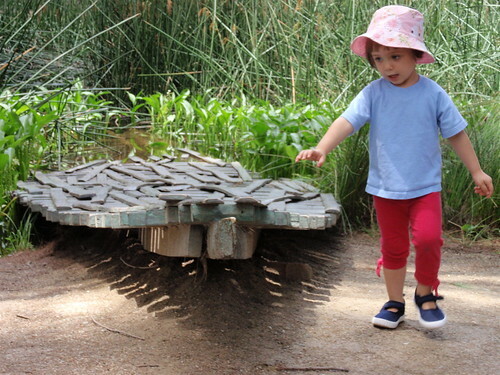 The large spaces seem to encourage the children to run and play and have fun. I particularly liked the sight of groups of children rolling with great hilarity down the grassy slopes that form the roof of Parliament House. We had a brief moment when we thought we might see the current visiting exhibition at the National Gallery. But the extraordinary length of the queues, and the presence of my small grand-daughter meant we reconsidered our options. Nevertheless, it was heartening to see so many people of all ages, dressed in their thongs and sandals, shorts and t-shirts, interested in the exhibition. 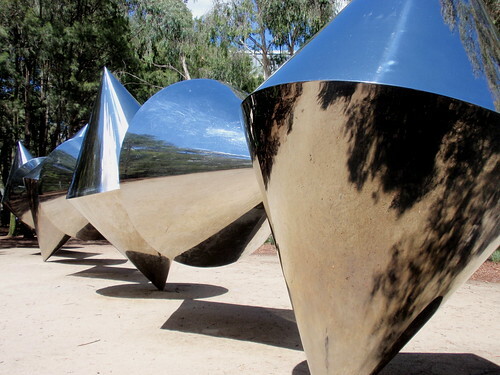 We made the sensible and enjoyable decision to spend most of out visit in the National Gallery's Sculpture Garden - which is really just a part of the publicly accessible grounds surrounding the Gallery. 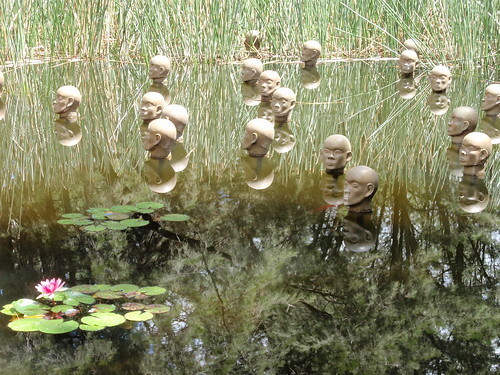 These wonderful sculptures can become part of people's daily walk or cycling routine. So, we enjoyed our visit to Canberra with its grandeur and informality, its rural location and its centrality to Australian life, and its general sense of a nation in formation. 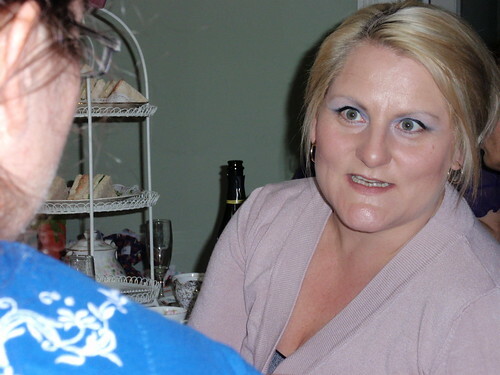 When we visited my brother, the dotee decided to describe all her newly encountered relatives as 'my people'. In the same spirit of affectionate appropriation, I'll regard Canberra as 'our place'. This Christmas I knitted some gifts. I didn't really plan to do it - it just kind of evolved. So there was no pressure about it, and, as it turned out, a great deal of pleasure. Despite Germaine Greer's warnings about the perils of 'homemade' gifts, my knitting seemed to be much appreciated by the recipients. Admittedly, they were family members whose tastes I know well, and a lot of thought went into choosing colours and appropriate styles. I knitted a small blanket for the small dotee - my grand-daughter. It's made from Noro Taiyo yarn in a particularly riotous colour-way. The Taiyo is primarily a cotton and silk mix. 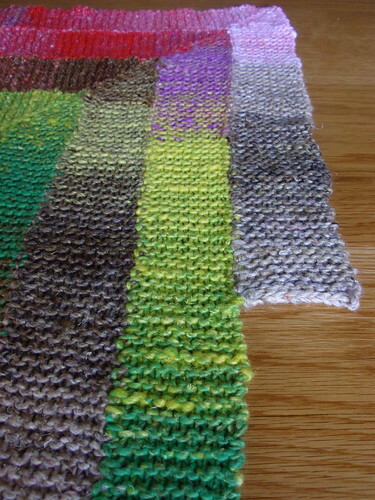 As it has none of the prickliness of some of the Noro yarns and it is comfortable for a blanket. 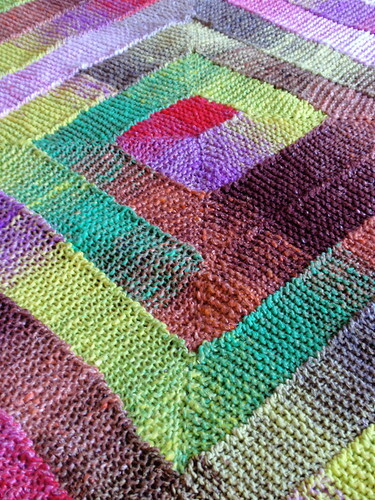 I washed and blocked it before giving it away and was delighted by how well it washed. The pattern is Frankie Brown's Ten Stitch Blanket (ravlink). Garter stitch forever! Great fun to make. I just knitted till I ran out of yarn - so that there is an irregular edge on one side. 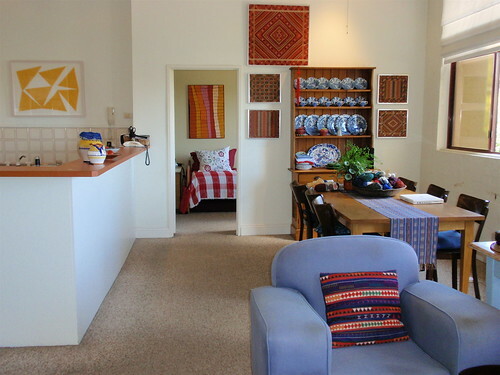 This was one of the options suggested by the designer and it appealed to my liking for things with neat irregularities. I've since realised that it has the added advantage that I can add to the size of the blanket as the dotee grows (as long as I can find extra yarn). 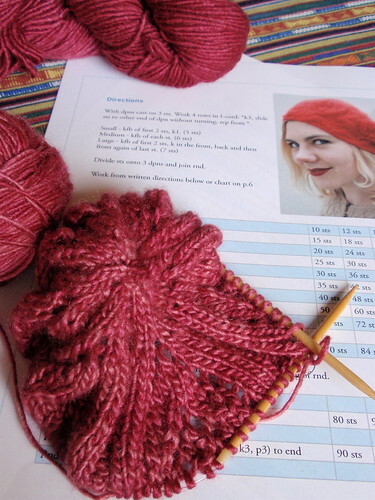 I also knitted Ysolda Yeague's Rose Red tam from Malabrigo Silky Merino for my daughter. Apart from the fact that 40cm circular needles are very uncomfortable to knit with if you have arthritic hands, this has to be a perfect pattern to knit. It's clearly written and charted, with enough variety to keep you interested but not so much you can't find your place easily if you've had to put it down. I think it's the first thing I've ever knitted that I can say is completely error-free. 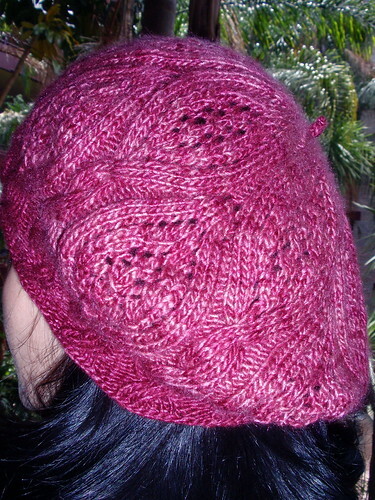 The tam fits my daughter perfectly, and the colour, 'Rupestre', a deep, glowing purpley-rose, is ideal. I've already posted about the third gift - a scarf for my son-in-law who thinks a scarf is the most useful piece of clothing ever for cooler weather. What more can you ask from gifts? They have given me great pleasure to make, and seem to have brought pleasure to those who received them. Double pleasure. Even when your office is on the 27th floor, the view from the window is sometimes surprising. 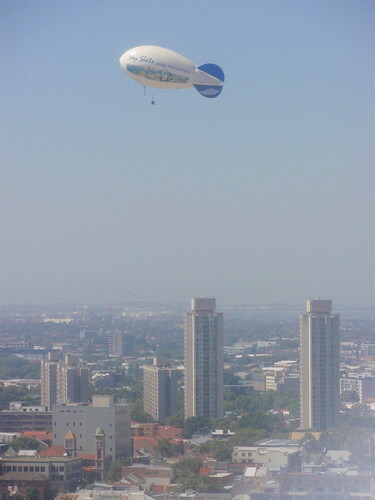 The logo on the side of the blimp informed us that its purpose was aerial photography. Despite the haziness of my pictures (partly Sydney summer heat haze; mostly the grime on our windows) yesterday was a beautiful clear day in Sydney so they should have taken some great photos. 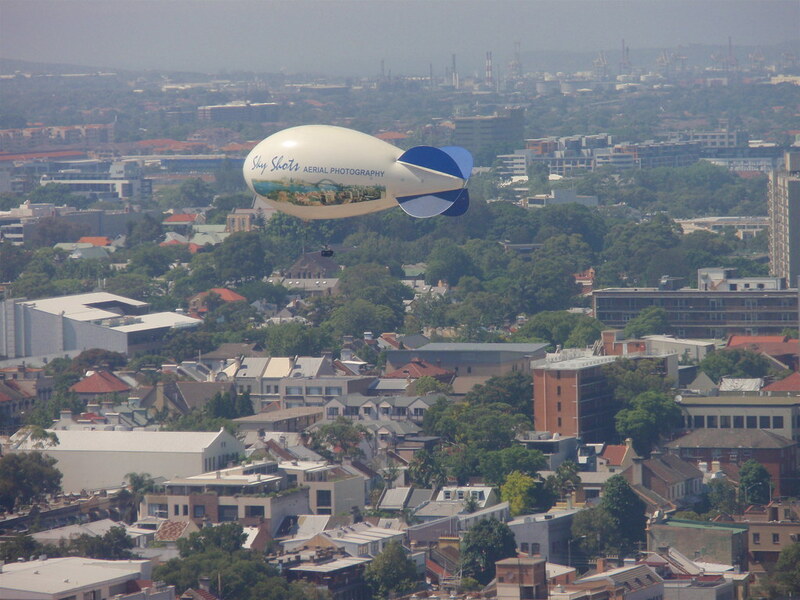 I don't know how such things work, but I was hoping the photography was remotely controlled and that there wasn't a person in the small basket suspended from the blimp, as both the blimp and the basket were roughly buffeted by yesterday's sea breezes (Sydney translation - winds). Bits and pieces. Odds and ends. Transitions. Distractions. That's the way things feel at the moment with the bustle of Christmas approaching, with another year ending, and with the prospect of a new year ahead with all its possibility for change. So, in this distracted spirit, a rather scattered and dispersed entry. If you asked me, I would probably say that I really dislike things that might be described as 'whimsical'. Whimsy is too coy and too cute to appeal to me. Despite this, I've bought both editions of Ysolda Teague's 'Whimsical Little Knits'- the second of which arrived last week. 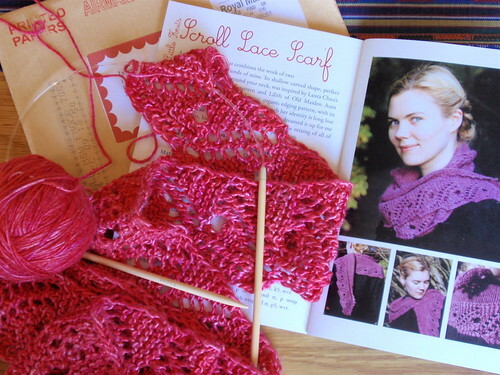 I'm making the Scroll Lace Scarf from volume 2, using Knitabulous's 'Silkstream' - a rich, deep pink 100% silk yarn. I'm making it very slowly, as I've been distracted by Christmas gift knitting. Ysolda may see her creations as 'whimsical', but they also have the practicality of well-written, easy-to-follow instructions. I work at a university, and last week the second year Industrial Design students held a market. 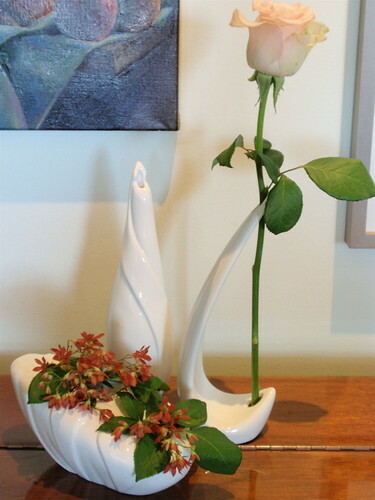 The students had been given the task of designing a small white pottery vase that was inspired by a particular flower - daisies, tulips, irises among others. They then had to make an edition of ten vases, design and make the packaging, and sell them. Fortunately, my work group and I had read our notices that told us of the sale and were the first customers when the market opened. What a great project. Some of the students sold all ten of their vases within ten minutes. All of them had sold within an hour. I bought three vases - initially thinking they could be gifts. But they look so good as a group I don't think I can bear to part with any single one. The packaging (each piece individually made) was almost as wonderful as the vases. This year I've been having my 'bah! Humbug!' Christmas moments about Christmas e-cards. I love getting real, ie paper, Christmas cards, though I'm not always so meticulous about sending them. However wonderful the e-cards are - and some of them use beautiful images - they're not the same. They don't have the anticipation of opening the envelopes, the pleasure of reading the message that the sender has taken the trouble to write by hand, and then the indecision of where to display them. And I hate being told that e-cards are more environmentally friendly! 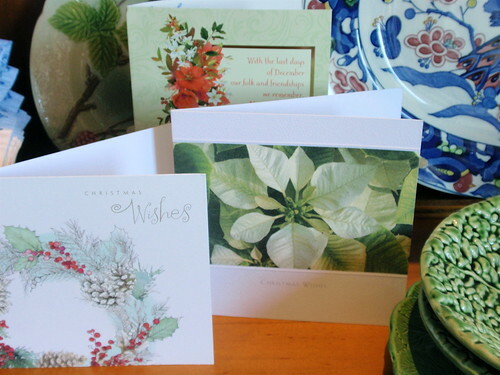 They require two sheets of paper (one for the envelope, one for the card) once a year - a minuscule environmental cost compared to the advertising brochures that flood into my letter box - and they provide employment for the card designers and manufacturers and for the post office. Oh, and I forgot to mention. Most of the e-cards are from companies I've never used or people I've barely encountered - people who would never bother to send me a 'real' card - so they're hardly a saving of any kind. One of the many things I like about this time of year is the 'best of....' lists that start appearing about now. I haven't quite worked out what the fascination of such lists is - I can become absorbed in lists of favourite things about which I know nothing, but I particularly love lists about things where I know enough to at least have an opinion. A unexpected benefit of keeping a blog has been recording in a side-bar the films I've seen over the last year. So, for the first time in my life I actually know what films I've seen (admittedly I did have to look up a couple of them as the titles no longer meant anything to me). Before I list my five best films for 2009 this is a bit of background about my film viewing habits. I don't watch films at home on DVD. When I've tried to do this I find I get distracted and don't really focus on the film. I like to watch films in the cinema - in the dark, surrounded by sound, and on the big screen. And perhaps I should give some background statistics for my rather odd list. I've seen 60 films in 2009. That's 1.2 films a week. Of these, 24 were American films, 12 from the UK, 12 from Australia, and nineteen from other countries - all non-English language films. There's a bit of double-counting here as some films were co-productions across countries. I'm astonished at how many of the films I saw were from the USA, but I guess I shouldn't be surprised as it simply reflects the dominance of the US film industry. So, ta-da! In order of preference, my five best films of 2009. 1 Samson and Delilah. This is an Australian film about a two Indigenous teenagers in Central Australia. It's a love story, and it's a bleak survival story. Some critics have said there's hopefulness at the end of the film, but I think that's clutching at straws. It's superbly filmed, convincingly acted and edited to perfection. It's harrowing to watch, and every moment rings true. I'm in good company with this choice as it's just been judged best Australian film for 2009 by the Australian Film Industry (AFI) awards and will be Australia's official entry in the best foreign language film for the Oscars. The film is notable for its sparse dialogue, but what little there is, is in Warlpiri. There's a good review (ie one with which I agree) here. 2 Disgrace. Another Australian film, but set in South Africa and faithfully taken from JM Coetzee's great novel of the same name. It features a chillingly true performance from John Malkovich and works both at the level of telling an emotionally shocking story about personal relationships and at the metaphorical level of a portrayal of the race dilemmas of modern South Africa. 3 Wake in Fright. Yet another Australian film - a new print of a film made in 1971. I remember seeing this film in 1971 and being shocked by a most recognisable portrayal of a violent, racist, misogynistic, achingly lonely, rural Australia. It still has the power to shock and has great value both as a depiction of a moment in our history, but also as an indicator of where many present values and practices have their derivation. 4 Revolution Road Finally, not an Australian film, but a film produced from the UK and set in the USA. A film about marriage and women's roles in increasingly affluent 1950s America. Brilliant script, movingly wonderful acting from Kate Winslett. 5 Genova. I don't think many critics would agree with me on this one. It's a film about grief and dealing with loss and about parental roles and relationships with children. Again, for me, a perfect script, with just enough said and left unsaid. I was on the edge of my seat for the whole film, willing that grief would not lead to disaster. I'm rather surprised that my three best movies have all come out of Australia and are all, to some extent, films about race relations. Taken overall, these films are rather a grim lot, aren't they? However, if I'm going to take the trouble of going to the movies, I like to be well-rewarded for my time spent. I like film-makers who respect their audience and who believe there are tales worth telling. I'd love to see other people's choices. 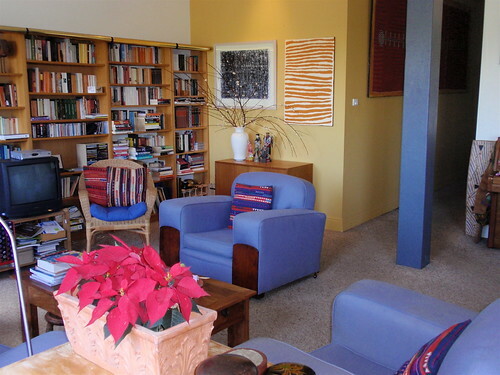 Last Friday - December 11 - marked 25 years since we moved into our apartment. It's a long time to have lived in one place. I think I have an image of myself as someone who's not particularly attached to a place, so I'm surprised to realise I've lived here so long. So much has happened in that time. We came here as a family - parents and two children. But the children have grown up and moved away and the marriage unravelled. When we came here I was part of the 'middle generation' - my parents and parents-in-law were all still alive and we seemed to be in the centre of all the comings and goings of family relationships. I'm now part of the oldest generation and inevitably the centre of relationships is shifting. 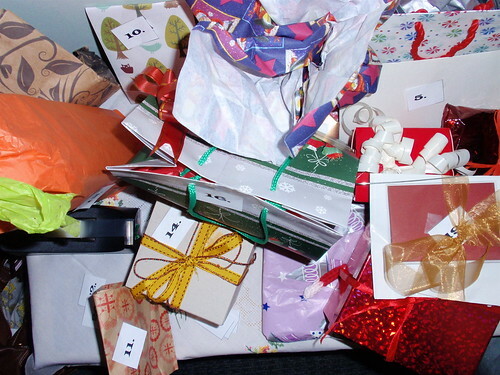 Lots of birthdays and Christmases, and some births, deaths, marriages and separations. We will sell the apartment next year. For me, this won't be a huge change as I'm going to move to a smaller apartment in the same building. I'll have the same neighbourhood and will keep all the things I like about the suburb in which I live. But, inevitably, it will feel like the end of an era for our family. In fact, it will be the end of an era. 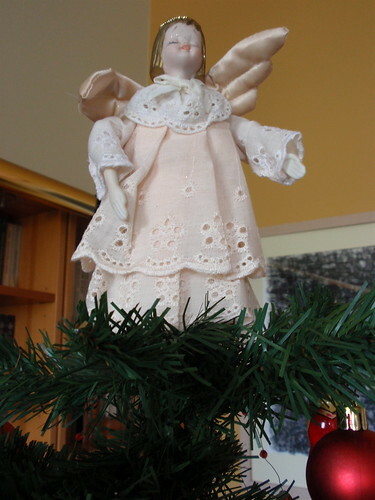 I'm pleased that my daughter, son-in-law and grand-daughter will share this last Christmas in the apartment with me. It's impossible to dwell only on the past and not look to the future when you have small children around. I've been suffering knitting disruption over the last week or so. I ran out of yarn for the blanket I'm knitting and have been waiting for more yarn to arrive. I left my sock knitting at work over the weekend (and yes, I'm aware this is yet another example of my forgetfulness). There's been the pleasurable but distracting build-up of end-of-the-year festivities. And I've had an old and good friend staying with me which has resulted in more than usual, and very pleasurable, visits to movies, galleries, markets and eating out. But there's also pleasure to be had in staying at home. Last night I was able to settle down to my knitting. 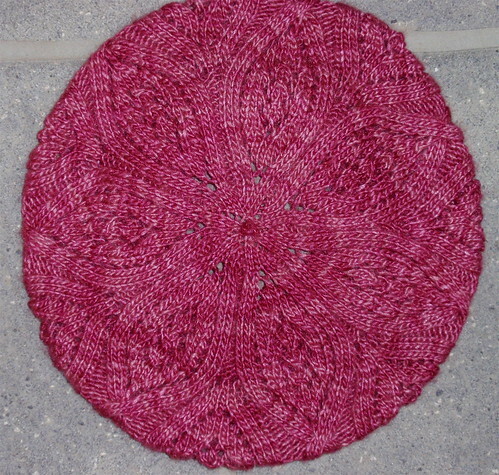 I wound the skein into a ball and cast on for Ysolda Teague's tam pattern 'Rose Red'. It's destined to be a Christmas present, and so far everything that everybody has said about it being a fun and straight-forward knit is true. I'm knitting it from Malabrigo 'Silky Merino' which feels and looks soft and luxurious. Once again I'm having problems in having my photograph capture the colour of the yarn - it's called 'Rupestre' and is more a deep rose-purple colour than the image above. Now I just need time to finish it. PS I've just googled 'rupestre' and discovered that 'pintura rupestre' or 'arte rupestre' are the Spanish and Italian terms for 'rock art'. The colour of the yarn seems roughly to approximate the colour of the markings in ancient rock art. 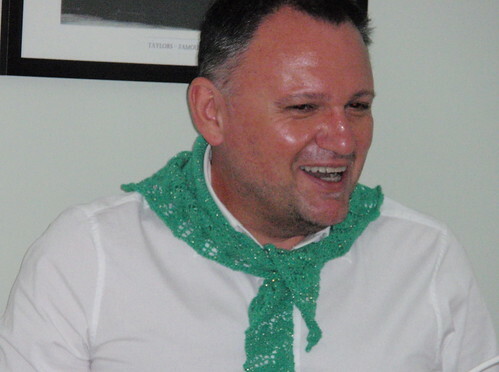 An education through knitting (and google)! 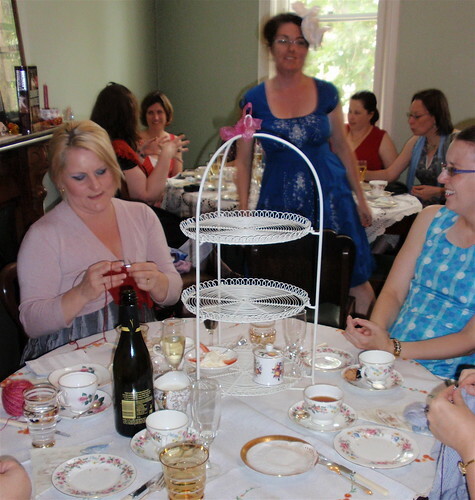 Tea, knitting, friends, bubbly...what more could you ask? 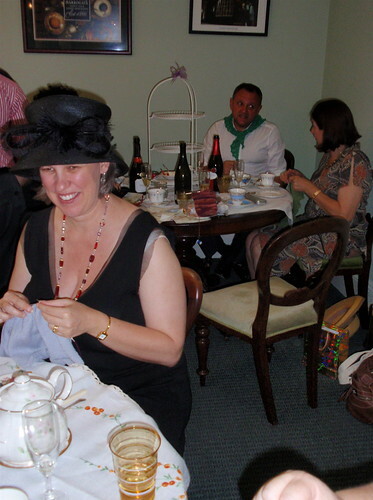 The Morris and Sons Knitting Group had afternoon tea at the Harrowgate Tea Rooms yesterday. Great fun! 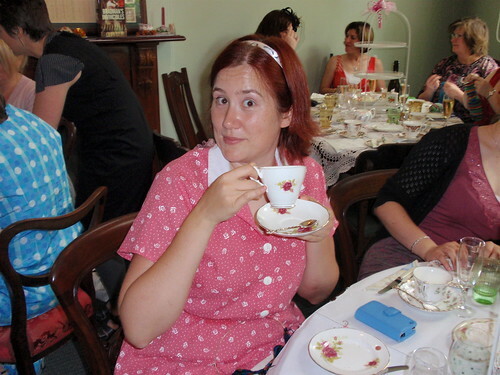 Friends, knitting, three kinds of tea, sandwiches (with crusts cut off, of course), scones with jam and cream, tiny cakes, chocolates, and lots and lots of bubbly to drink. 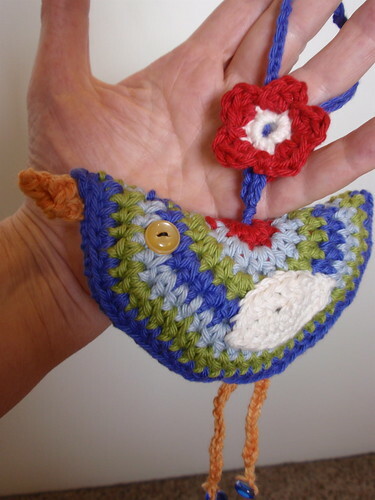 for which I crocheted (yes, miraculously, I crocheted) a bird. And, most wondrously, we were honoured by a visit from the real Rose Red Shoes.